Taking advantage of the slowest time of the year. The absolute slowest time of the year. I suppose one can look at it in two different ways. On one hand you’ve got no work and the money that you stashed away can only last so long so you’re under pressure to find more work. On the other hand now is a good time to relax, take it easy as well as get some things done. In our last newsletter we talked about utilizing this valuable time to go through your safety equipment. In this one were going to talk about something that is definitely not new. Getting more business. While some of you are able to do just fine by word-of-mouth you can definitely bet there are other ways to get more business. Undoubtedly, in the year of our Lord 2016 the most dominant option is locating customers through the Internet. In order to achieve that you first must be able to be found. Making what you’ve got work for you. For those of you that do not have the website for your pilot car company you’re pretty much dependent on whatever ads you can get up and loads that the broker dishes out for you. Other than that there is the message boards and word-of-mouth. That might work just fine for some of you but for companies that wish to take a more aggressive approach and maximize their profits without a third hand in the cookie jar there are ways that you can use this valuable downtime to put yourself in a better position to attract direct customers so you’re dealing directly with the truck. While brokers are a necessity to the industry as they can save you from a long trip home you don’t necessarily have to be dependent upon them all of the time. One of the beauties of the Internet is that it will work for you even while you’re sleeping or occupied doing something else. Let’s talk about some of the ways to maximize your exposure so your pilot car company is bringing in more money this season. Let me share with you a little bit about how search engines work. If a search engines little spider comes upon your listing on any website the first thing it does is looks at the content and analyzes it. Then it takes that information and reports it back to the mothership. Now, if there is just a little bit of information such as “lead, chase, high pole and all lower 48 we do it all”, a company name and a phone number then there is not very much for the mothership to work with. Meaning that particular listing is going to be left into obscurity on page 54 of the results. So what’s happening is you are solely dependent upon whatever site your listing on to filter web traffic to your listing. 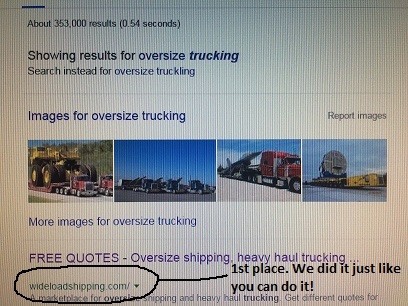 Now with WideloadShipping.com that’s not too hard as we have trucks coming to the website dealing with customers in order to get freight so it makes it pretty straightforward and easy when all they have to do is click on a link that’s been there for almost 15 years. But with other sites that’s not necessarily the case and you have to ask yourself okay why is traffic that is specific to the trucking industry and pilot cars coming here? 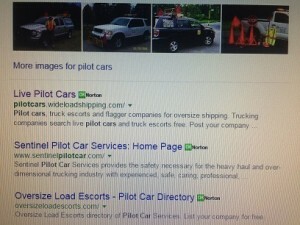 In other words why are people that are looking for pilot cars coming to this place? If you can’t come up with an answer then that’s your answer they simply aren’t. So that’s not to sell you on our service but rather give you proper perspective on what’s going on. So, no matter where you have a listing at we suggest you go to that listing and spruce it up. Now, as far as Google is concerned they suggest you have a minimum of 300 words about your company and the services it provides. This way the spider has something good to take back to the mothership. The more it has more will take back, the better it is the higher you are going to list in the rankings. In other words your listing on any website can be a double add sword if you make it as such. Meaning you can get traffic to your listing not only through the website that you are listed on but also your listing page can show up independently within the search results on its own. Now I don’t know about you but even if I was somewhere where my listing was free I would want to utilize all the power that I possibly could in order to keep my pilot car company busy. For those of you that use the PiloTrac system this means logging into your account and adding good, solid keyworded content to your listing. Also, upload as many photos as you possibly can. Not only will this information that you provide help you to get more customers but you are also providing good information to potential customers about how awesome your pilot car company is and why they want to have your company leading or chasing their trucks. Is very important to us that our customers are getting the absolute most from the service offering we provide. Not only do we want you to succeed but we need you to succeed as we are dependent upon your success and cannot grow without you. That brings us to something else we’d like to mention really quick. As many of you know we have hired two different companies that have both failed in providing us with a phone application for the PiloTrac system that will work properly. The last time was close but ultimately in both cases we lost money. We now have a third company that says they can do it. So were going to give it another shot. At this point were not going to hold our breath but certainly hope that the third time is a charm. More on that later. Without a doubt you have signed up for a “free” load posting only account. I will delete the old one for you so you can create a new account. I’v sign up, But for the life of me I fine no place to make my paymemt!